There were a few moves this weekend among the Redbirds, including our boss Kyle’s return to Memphis. For Ben and I, this means no more hallway hockey on the press level and for you readers, it means back to the two interns making all the posts. Yep. Opening Day is a little more than a week away, Spring Training is near finished and the Cardinals exhibition with the Redbirds is just days away. With all of these events on the horizon, the final opening day rosters are just about set. Over the weekend, Chris Perez was optioned to Memphis. The right-handed reliever pitched for a 3.20 ERA with the ‘Birds last season accumulating 11 saves and 38 strikeouts. While he should prove to be a reliable reliever in the ‘Birds bullpen early on, it wouldn’t be out of the question to see Perez in a St. Louis uniform sometime this season. Perez spent 41.2 innings on the mound with a 3.46 ERA for the Cardinals in 2008. Here we go again. And it’s a big one. In keeping with some of the recent transactions going down in camp, we thought it would be best to stay current and give you our second set of projections for the Redbirds Opening Day roster, two weeks before the team’s first exhibition game. We’ve decided to rule out Pujols and make the stunning prediction that he will begin the season as a Cardinal. Other than that, it’s easy to spot the lack of differences between this lineup and last Friday’s, but the re-assignments on Monday did manage to shake a few things up, most notably in the bullpen. We added left-handed reliever Charlie Manning to the mix, who finished his eighth year in professional baseball pitching in 57 games with Washington after starting the year with the Triple-A Columbus Clippers of the International League. In his major league debut, Manning posted a 5.14 ERA with 37 strikeouts versus 31 walks. Mitchell Boggs RHP – Ended the year with the Redbirds, finishing the season ranked first in the Pacific Coast League in ERA; made his major league debut with St. Louis. Jess Todd RHP – Ended the 2008 season with the Redbirds, pitching in 36 games with a 3.97 ERA on the season. P.J. Walters RHP – Led the Redbirds in strikeouts in 2008 with 122. Clayton Mortensen RHP – Pitched in 15 games with Memphis, recording 57 strikeouts to 87 hits in 310 opposing at-bats. Blake Hawksworth RHP – Appeared in 18 games for the Redbirds, compiling a 5-7 record with a 6.09 ERA. Tyler Herron RHP – Threw for a career-high 137.1 innings with a combined 102 strikeouts and 40 walks in 2008. Matt Scherer RHP – Finished his first season as a Redbird with a 3.93 ERA, accumulating 32 strikeouts. Ian Ostlund LHP – Spent his first full season at the Triple-A level with Toledo, compiling a 3-0 record with a 2.44 ERA in 44 appearances. Luke Gregerson RHP – Spent the full season with Double-A Springfield, compiling a 3.35 ERA and a 7-6-10 record in 75.1 innings as a reliever. Fernando Salas RHP – Named Scout.com’s “Reliever of the Year,” leading the Texas League in saves (25) and games pitched (60). Josh Dew RHP – Threw a total of 50 innings for a 1-2-2 record with a 4.50 ERA for Springfield. David Freese – Appeared in a career-high 131 games with a .306 average, 58 extra-base hits and 91 RBI. Tyler Greene – Began his fourth year in professional baseball with Double-A Springfield, hitting .259 with 25 extra-base hits and 41 RBI. Allen Craig – The Texas League All-Star finished the season ranked third among Texas League batters with 154 total hits while with Double-A Springfield. Jarrett Hoffpauir – Hit .273 with 31 doubles, four homers and 45 RBI after spending the entire 2008 season with Memphis. Brian Barden – Hit .285 as a member of the Redbirds and earned his third stint in the big leagues, hitting .222 and recording his first major league RBI as a Cardinal. Joe Thurston – A 2008 International League All-Star who makes his return to the PCL after three years of absence. Jon Jay – Hit .345 (20×58) with six extra-base hits and 10 RBI in his 16 games with the Redbirds. Nick Stavinoha – A 2008 PCL All-Star with the ‘Birds, finished ’08 hitting .337, which was fifth- best in the PCL. Shane Robinson – Shined in Springfield batting .352 (86×244) and produced a .220 average as a ‘Bird. Brian Barton – Appeared in 82 games with St. Louis, putting together a .268 average with nine doubles, two triples, two home runs and 13 RBI. Bryan Anderson – Appeared in 73 games as a Redbird with a .281 average, 13 doubles, two triples, two home runs and 27 RBI; was selected to participate in the 2008 Futures Game. triple, 10 home runs and 34 RBI. While there aren’t many spots left, there are still some question marks going into the season. In particular, the bullpen situation is still somewhat up in the air and the backup catcher spot is in no way set in stone. Minor league Spring Training games kick off tomorrow, so there should be some more definitive answers once Redbirds camp gets underway. If we can make assumptions based on speculation, so can you. Let us know what you think the roster should or will be as the countdown to the first pitch of the 2009 season continues. 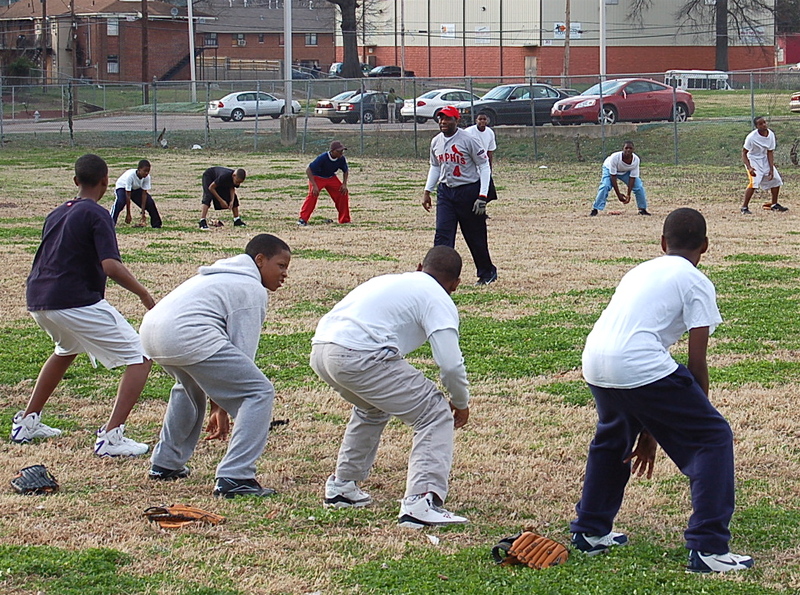 As we wait for the professional ball players to return to Memphis, we fill the baseball void with what we have in the city through our STRIPES (Sports Teams Returning In the Public Education System) program. 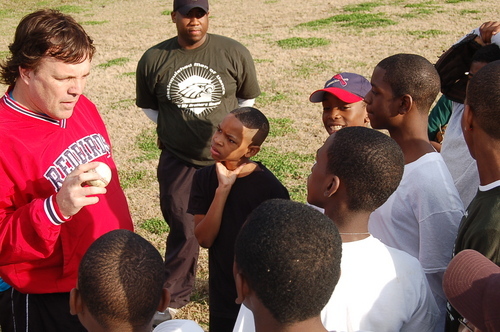 The following are photos from last Thursday’s clinic at Vance Middle School. For more information on STRIPES, check here. I couldn’t help remembering my Little League career when I was taking these photos. My one shining moment when I hit the ball down into left field for a single. I would usually just hope the pitcher would walk me. I never swung. And the memory of missing an easy pop-up in right field. The highs and lows of the College Grove Hitters. Any stories out there from the readers? Please comment. Perhaps remembering baseball will help speed up the three weeks remaining before the Cardinals exhibition game Friday April 3. Herron, Katsuhiko Maekawa, Ian Ostlund and Francisco Samuel; catchers Tony Cruz, Luis De La Cruz, Steven Hill and Justin Knoedler; infielders David Freese and Brett Wallace. Stay tuned as we get more news filtering out of Spring Training. In our ongoing quest to conquer the Internet, the Redbirds are pleased to announce that we have set up a brand new Twitter account. This will hopefully enable us to distribute even more information as quickly as possible. Feel free to use the area as a platform to let us know your opinions on what is going on with the team as the season gets underway and what information is important to you. As always, for any news regarding the Redbirds and what all is happening this season, check out our main page at memphisredbirds.com. Hello and welcome to what will be many new entries into the world of two dudes interning with the Redbirds. Hopefully this will be an enjoyable experience for those who are fans of the Redbirds, the sport of baseball and the even bigger game…of life. And more importantly, we hope this won’t be a complete waste of time. We’ll be making new posts as much as possible to keep you informed about the comings-and-goings of the Redbirds family. We absolutely encourage and welcome as much feedback as possible. Our goal is to make this area as much about you guys as it is about letting everyone know what’s happening with the Redbirds this season. So, make sure and tell us what you like, what needs improvement and what you think is just absolutely horrible. We can take it. In his apparent quest for the perfect indie-chic outfit, Alex made his way to Memphis by way of Knoxville, TN, where he received a Bachelor’s Degree from the University of Tennessee. Outside of baseball, Alex is an authority on all things Nashville Predators and is a firm believer in the glory that is novelty pin collecting. Where as most males might be bashful of their shortcomings, Alex is frighteningly open about his paralyzing fear of flying insects and knows when to bring in reinforcements when bug killing dirty work needs to be enacted. He has a well-developed background in the underground music scene, always keeping his ear to the ground to catch what new sounds are making their way to the listening public. He’s pretty good at it, too. Some call him skinny, but most of us call him friend. Thanks for all you do. If there’s one thing that is glaringly obvious when you walk into the Redbirds Media Department, it’s the fact that there is a Texan in the room. Thankfully the office has a dress code policy, leaving his boots and spurs hanging in the closet at home. Granted I’ve only known the 24-year-old spittoonin’ cowboy for a little over a month, but not a day goes by without a ‘guns up’ cheer and hand gesture (the equivalent of a pleasant ‘how are you’ in Lubbock, the proud city of Texas Tech and Ben’s college of choice). Ben is using this internship to fulfill his final 6 credits to earn his Master’s in Mass Communication. Overkill I think. So while the Texan pride may not yet be evident in his writing, before long you could start seeing posts about the Astros, Rockets and dirt. We’ll start getting into a little baseball and begin gearing up for the season in future posts. Along the way we might throw in some music, movies and other miscellaneous interests, but first and foremost we are a baseball blog meant to let you know what’s happening with your Memphis Redbirds. Stay tuned.